Saturday's debut event at Challenge Bahrain (www.challenge-bahrain.com.bh) has, not surprisingly, been gaining headlines all over the triathlon and sporting media over the past week or so. A new event, with a $500,000 professional prize purse, live coverage of a truly impressive and deep professional field for an event which has set its stall out to be one of the best triathlon events in the world, from day one. That status and prestige looks set to grow further in 2015 with the announcement of a Middle East Triple Crown, culminating in a $1million prize purse at next years Grand Final in Bahrain. I had the chance to experience the race in person, travelling out to Bahrain on Wednesday last week with my wife (plus her sister and husband), but this time, to also take a look at the event from the prospective of the Age Group athlete and not just as 'media', as we would also taking part in the event ourselves. 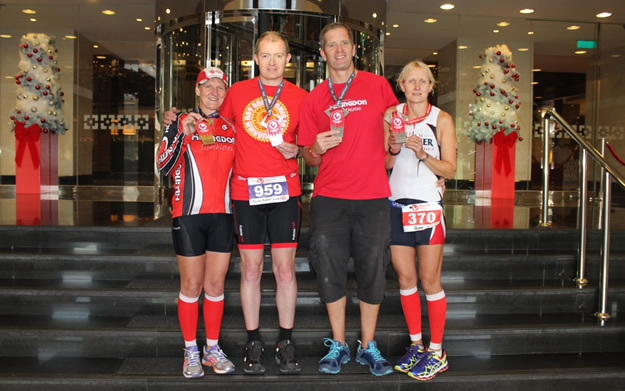 What was the race like for the Age Grouper? For the professionals, the opportunity to race for a significant prize purse and also receive superb hospitality, hotels, transport and more will of course leave them (and quite rightly so), speaking publicly in glowing terms about this debut event. But, how was it for the masses? Should you consider spending your own money to travel and take part in future years? Well, having paid our own way to Bahrain, this is our honest assessment of what we found and our personal experience. 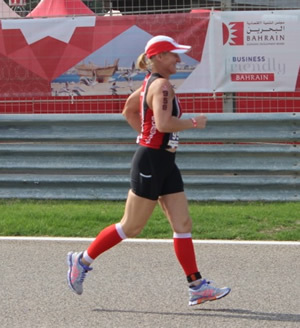 Prior to the event, the Challenge Family and the Challenge Bahrain event had put particular public emphasis on the Age Grouper experience, and with a total sign up of over 1000 athletes, there were plenty of people willing to travel to this new event - with athletes representing 52 countries present. Did it live up to their claims? 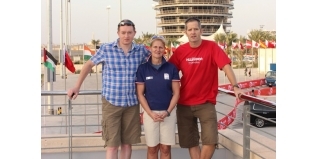 The event was a two transition set up, with the swim start and T1 based in the capital of Bahrain, Manama, with T2, and the finish area at (well, on! ), the Bahrain International Circuit (BIC), which has hosted the annual Bahrain Formula 1™ Grand Prix since 2004. Race registration, Expo and Pasta Party / Race Briefing plus Awards / After Party were all based at the BIC. We chose to stay in Manama, close to the swim start at the Intercontinental Regency Hotel, which was one of the five recommended event Partner Hotels. As well as being walking distance from the swim start / swim practice / T1 (as was the Crowne Plaza Bahrain Hotel), by staying at one of the Partner Hotels you also benefitted from free shuttle buses throughout the week from the hotels to the key locations in the days prior to the event and on race day. These were provided by the race organisers, and worked really well. Thus, getting from our hotel to registration / expo (and back from the pasta party), from T1 to T2 on race day (for Relay teams), post-race from finish to hotel and returning from the after-party / awards etc was all taken care of. Other than a taxi from the airport to our hotel on arrival (which is very close to Manama centre, and costs only around £10-£12 equivalent each way), we didn't need to pay for or worry about transport at all. This eliminated any initial concerns of not being near to the BIC, and when (I hope...) we return in the future, I think we would again choose to stay near to the swim start in Manama (which also benefits from plenty of coffee shops, restaurants and shops - you can even get your usual Costa or Starbucks coffee...). Firstly, the swim takes place in Bahrain Bay with the backdrop of the iconic Four Season's Hotel. You were invited to swim over to the Four Seasons, where you would be served fresh espresso and snacks. Very nicely done too, with starched linen table cloths and smartly dressed hotel staff! Post-swim - and this really was impressive - there was a complimentary buffet breakfast provided (all included within your race entry), next to the swim exit in a specially built marquee. This was not just a couple of croissants either... this was basically the equivalent of any four star plus hotel buffet breakfast, with a massive range of pastries, fruits, meats, hot foods and more! In purely practical terms, if you were to arrive on Wednesday and go for a swim on Thursday and Friday, you need have no concerns about booking 'room only' at your hotel. Very impressive, superb quality and I've never seen anything like that before at races I've been to. The 'goody bag'. I don't know how or where it started in our sport, but it seems that the goody bag has become almost as important for some as the event, the first physical sign perhaps of what you 'get' for your entry fee. 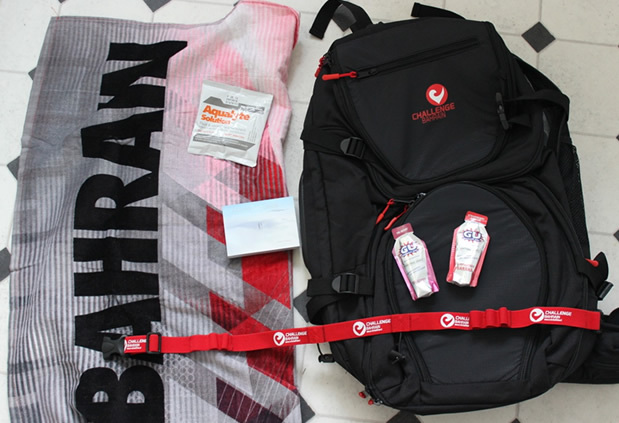 Difficult to have many complaints here - the Challenge Bahrain rucksack provided to all entrants is a) huge, b) triathlon specific and c) it seems, very good quality too. It's similar in style to the large blueseventy and Huub transition bags which seem to be the most popular in my circle of triathlete friends at least, and that's a good compliment. We also had a large, bespoke, Challenge Bahrain towel and then various other additions (GU Gels, energy drinks, a Challenge Bahrain number belt, a nice photographic book of Bahrain...). The bike race numbers were also a nicely considered detail, using the VonDrais V-Tag system that is used at Kona, among other events, rather than another sticker to add. Race numbers were also personalised to include name (individual or relay team name), and country. Transition bags were of the now familiar 'bike bag', 'run bag' and 'street wear' set up. The Pasta Party was combined with the Race Briefing on Thursday night at the Bahrain Circuit. Given that, we decided to register late on Thursday afternoon for our events and then stay on for those, before returning to our hotel (on one of the free shuttle buses, of course...). Now, I can't say Pasta Parties are one of my favorite aspects of races. I've probably avoided more than I've gone to in the past, as waiting around for hours for a scoop of bland looking pasta shells with some tomato(ish...) looking sauce on top was, more often than not, hardly the highlight of my event experience. I'm guessing Sheikh Nasser may have had similar thoughts when touring events around the world - and returned determined to do things differently. The Bahrain Pasta Party food was by a county mile, the best I've ever been to. Lots of it, loads of choice, amazing salads, stunning puddings with offerings to suit pretty much every taste. Even with close to 1000 people in the room to feed, no queues of any significance and more than enough for everyone... and then back for more. All the while, waiters were bringing round (complimentary) soft drinks, while bottled water was already supplied on the tables. Top quality. A great job by the catering team and organisers - and that's another meal you don't need to pay out for! 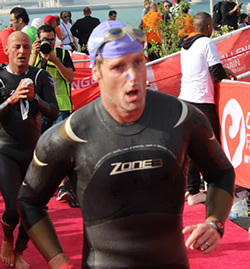 The swim course was a relatively simple and safe 'out-and-back' rectangle, in the waters of Bahrain Bay. Wetsuit legal, with temperatures around 20°c, made that pretty pleasant with the long stretch to the first turn boy, combined with wave starts meaning a pretty comfortable swim for all. All waves appeared to go off on time too, with Male Pro's at 7.30 am through to the Relay teams at 8.45am. Transition was efficient, with the typical 'Challenge' style transition bags outside / ordered by number plus change tents. For Relay teams (which I was in), a separate changeover at the far end of transition worked fine. It also meant that the biker could hold the bag/kit of the swimmer, and then hand that over (when they in return were getting the timing chip). No lost bags, nice and simple. Importantly, those shuttle buses seemed to work well again and transported my swimmer and runner to T2, arriving well before I was going to get there. Given the bike leg took place on completely closed roads, that's quite important. The bike leg, for the most part, took place on superb roads, mostly flat with great road surfaces and three wide lanes. Other than making sure you avoided the pronounced 'cats eyes' in the road if moving lanes, no problems at all. The course was a single circuit 90km course, with the first loop 30km in the north, before returning close to the T1 area and then heading south towards the Bahrain Circuit. It is definitely a time trial dream course (even if, I'm sure there was more headwind than expected?! ), so if possible make sure you are comfortable on your tri bars. I didn't witness any drafting at all (I did see several race referees on course), either in the areas I was riding or on the 'out-and-back' sections towards the end of the ride. The race numbers, combined with the (mostly), three lane closed roads and wave starts - form my viewpoint at least - appeared to make it a fair race despite the flat nature of the course. The event could definitely expand in numbers significantly before drafting becomes a concern based on my personal experiences. As you might expect, there were not many spectators on the course. There were a few pockets of them, but generally it was just you and the course. What was great were the volunteers. Any road junctions were superbly marked and marshalled, while the aid station volunteers were plentiful, vocal and it appeared, had been well trained. As I was not swimming or running, I had all of my nutrition on the bike, and there were no issues keeping clear of the feed stations and riding past safely without getting in the way of other athletes. The weather was warm (my Garmin suggesting peaks of circa 27/28°), but still pleasant. This was not racing in a furnace! The bike course finishes with one complete lap of the F1 circuit - which actually included the steepest 'hill' on the course, before reaching T2 in front of one of the Grandstands. From the run course, my wife tells me that my comments on the volunteers above was just as valid. There were feed stations every 2km with a wide range of drinks, gels and nutrition, with the superb volunteers hugely encouraging throughout. You really couldn't have asked for more. The course was within the Al Areen Wildlife Park, and so the occasional Ostrich, Goat or Monkey would join you! 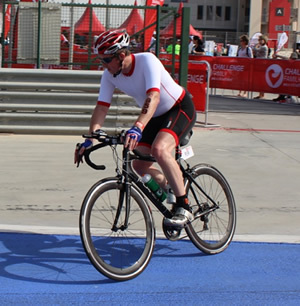 The finish line was back at the Bahrain Circuit after a one loop bike leg where runners would pass by the main grandstand, and then loop into the finish line area (where relay team members could join their runner to cross the line). As a one lap course, it is difficult to follow progress of athletes though as they depart the circuit and then only return at the end of the run. The finishers medal is HUGE, and rather than a standard t-shirt, you were awarded a very nice down jacket. Again, something different - and judging by how many people were wearing them later that night, very popular. The medal was inspired both by Bahrain's rich history and heritage and the grueling nature of the race. Several depictions of Bahraini heritage were explored before concluding that Dilmun seals are the quintessential depiction of Bahrain's past and pride. The medal was therefore designed in form to resemble the mythological Dilmun Bull's head, with it's horns as a clasp for the lanyard. The horns are engraved with Dilmun seals indicative of Bahrain's climate and the terrain of the race (the sun, palm trees and gazelles reflect the Bahraini landscape and the run at Al Areen). 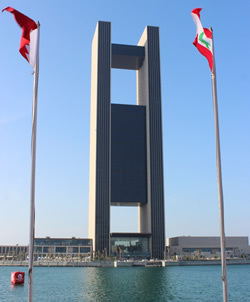 The Bahraini identity is also reinforced using the striking red and white color combination (which also coincides with the identity of Challenge), as well as the use of the 5 spikes of the Bahraini flag to separate the 2 parts of the medal. For the After-Party (food wise at least), see comments as per Pasta Party - another superb, top quality, extensive spread with enough choice to suit pretty much everyone. I know I cleared my plate (despite a post-race binge on chips...). That's two, absolutely superb evening meals (and two cracking breakfasts, if you went to the swim start), included within your race experience. As mentioned, a 'room only' room booking is a sensible choice here if you are going to attend all of these events. Age Group award winners should have been quite pleased as the trophies we saw looked very impressive and again, bespoke, featuring a map of Bahrain with the course highlighted. My sister-in-law just missed her Age-Group podium by two minutes, alas! I've no idea what the fireworks budget was for Saturday evening, but it must have been in the 'very substantial' range. Think London on New Year's Eve, and we are talking that sort of show. Absolutely stunning in person, some seriously impressive fireworks coordinators must have been recruited for this, with the detail even involving the 'show' finishing off with the red and white colours of the Bahrain flag. Impressive does not do it justice. Alas, photographs can't convey their quality - you'll just have to take my word for it! The evening was highlighted by the appearance of The Dire Straits Experience on stage, featuring original Dire Straits member Chris White and his band. Music clearly crosses the globe as well as generation, as when they started belting out Money for Nothing, Sultans of Swing, Romeo & Juliet, Walk of Life and more from that epic Dire Straits back catalogue, the party really got going to provide a suitable culmination to a superb few days. All told, we had a great experience in Bahrain. We felt completely safe wherever we were, day or night, and for a first time event the organisers really did excel. What really stood out for us was the combination of attention to detail and hospitality from everyone involved. No event is perfect, and trying to put on a international scale event from scratch having set yourself a goal of being the best triathlon in the world from day one, is quite a bar to set yourself. That said, the organisers gave it quite a go and produced an exceptional event of which they can be very proud.